Abstract: Introduces the functionality of the EDN Mobile Android application, and discusses the new features introduced with v1.1. The EDN Mobile app is now available in the Google Play store. It leverages the Java DataSnap mobile connectors to talk to a DataSnap REST service written in Delphi XE2. The first version of this app provided similar functionality to the Member Services web application, but the latest version has provided additional functionality to take advantage of smartphone features. This provides an overview of your Member Services registration data. This information can be changed by selecting the “Edit account” option from the EDN Mobile menu. Here you will find a list of all Embarcadero products you have registered, along with the serial numbers and keys (if applicable). This will show a list of all accounts that share the same email address as the one associated with the account you used to login to EDN Mobile. While we now enforce a unique constraint on EDN accounts, this wasn’t always the case. The “My location” feature is new to EDN Mobile v1.1, and is where we really start to leverage the capabilities of your Android smartphone. It will show your current location on a map, and will allow you to “check-in” at that location. 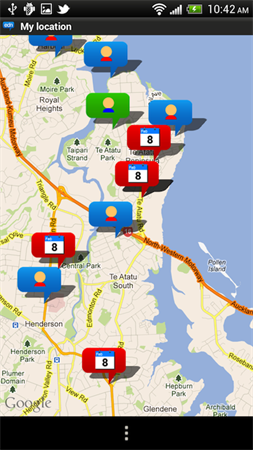 You will be able to search for any nearby EDN users who have checked in within a specified area (in kilometers). Only the last known check-in for a given user is revealed, and all your check-ins can be removed at any time. In addition to seeing any EDN users near you, it is possible to search for nearby events (useful for finding local user group meetings, presentations etc), once again within a specified area. When you initiate a user or event search, the results are shown as markers on a Google map which can be viewed either as a standard map or using a satellite view. This map can be panned and zoomed in the normal manner. The marker with the green background indicates your current location, and the blue markers indicate check-ins from EDN users within the area you specified. Likewise, the markers with the red background indicate pending events within your specified area. Touching a user marker (excluding your marker) or event marker will pop up a dialog showing details about that user or event. If the user has elected to share their email address, this will be shown as a hyperlink which will initiate a new message using your default email client. Similarly the creators of events can specify contact information, including email address, phone number and web page URL associated with the event, and these are hyperlinked to take the appropriate action when touched. The event details dialog also has a button allowing you to add the event to your calendar. If you are the creator of the event, there are also buttons allowing you to edit the event details or delete it entirely. Event and user details dialogs can be dismissed by using your phones back button, or by touching outside the area of the dialog. If you perform a long press, a context menu will be shown allowing you to create an event at the specified location, or to perform an event or user search within an area centered on that location. 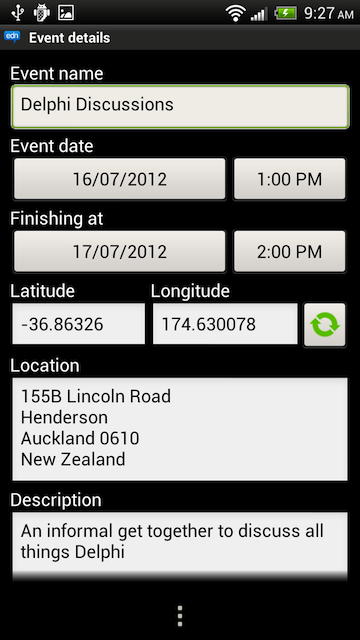 You can also create an event using the EDN Mobile menu. This will create an event at your current location by default, but these details can easily be changed. The simplest way to do this is to change the address in the Location field, and then use the “Refresh” button to the right of the co-ordinates fields to ensure the latitude and longitude values are updated to reflect the newly entered address. It should be noted that the user and event search functionality do not require you to check-in in order for them to function. It is possible to perform these searches as soon as EDN Mobile is able to determine your current location using the Android location APIs. But obviously if nobody checks in, the user search will not be of too much use. Likewise, the event searches will benefit greatly from user generated content, so please don’t be shy and start creating events for your local area. You could also use it as the catalyst to create your own informal meetups with like minded EDN users. Thanks to the generous efforts of EDN community member Whiler, and Andrew Sovtsov of Embarcadero, EDN Mobile has been localized into French and Russian. If you are a speaker of another language that Android supports localization for, I’d really appreciate it if you could assist with the localization effort. I have uploaded the string resource files to CodeCentral. This file will be constantly updated with the latest strings used by EDN Mobile (and a common utility jar), as well as all localized strings received to date. Any localized language that still has strings requiring localization will have the English version of those strings in the applicable XML file as a placeholder. These new strings will also be preceded by an XML comment identifying them. 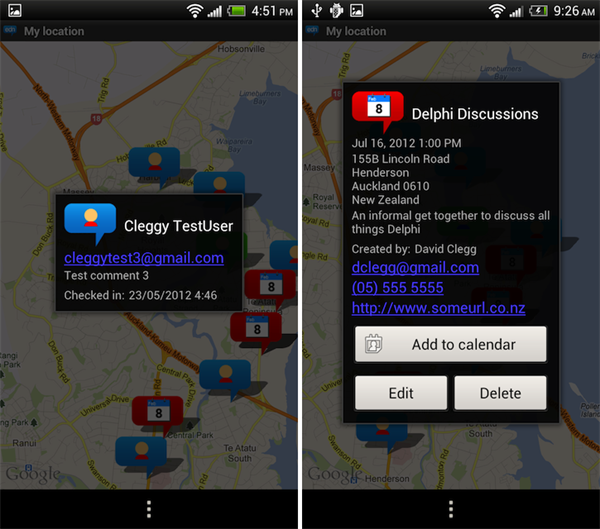 EDN Mobile provides a convenient way to access Embarcadero Developer Network functionality using your Android device. The new “My location” functionality relies on data generated by other EDN users in order to fully leverage its usefulness, so please don’t be shy. 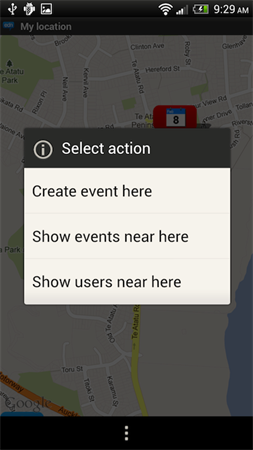 Download EDN Mobile today, and start creating those events and check-ins! David, Perhaps you can post here some parts and not all source. As a both server/client DataSnap complex sample will be very instructive for newbie developers. Will be source code (both server and Android client) available? Thanks!